Many classes at Upper Noe can be enjoyed on a drop-in basis, some for free. Registration for Summer Activities began Saturday, May 16. View the Summer Classes Catalog and Register online at www.sfreconline.org or stop by the Rec Center office to do so in person. Upper Noe is hosting seven week-long basketball camps (Mon – Fri, 9 -1) from June 8 to July 31. Early sessions are filling up but space is still available to join in the fun this summer. Register today. There can be no congregating in the lobby during summer camp hours, 9 am to 1 pm Monday – Friday beginning June 8. Nannies and children cannot nap in the lobby during camp hours. Sorry for any inconvenience but Rec Center staff have no flexibility on this rule. .
Rec center hours of operation increase to include Mondays from 9 – 5 beginning June 1. **Varies, depending on other activities. The Capital Committee of the Rec & Park Commission approved the design for the Walter Haas - Beacon St Trail on May 6. However, the plan varies significantly from the consensus criteria reached by neighbors at a meeting held at Upper Noe Rec Center on December 10. Rec & Park manager Lisa Wayne has offered an 'Open Air' Meeting this Monday, May 18 from 4:30 to 7 pm to allow residents to walk the actual proposed trail and to offer feedback. Staff will be stationed on Beacon Street across from Billy Goat Hill. Stop by anytime during these hours. 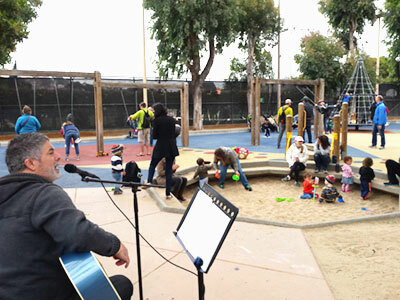 On Saturday, May 16 visitors to the playground were delighted by the rich tones of local talent Jeff Troiano playing his acoustic guitar and singing a mix of original songs and popular classic tunes. Sweet melodies wafting over the busy park added cheer to an overcast day and held the sandbox crowd in rapt attention. While Ladybug Gardeners leader Joan Lionberger tends to the plants, Markos Major of Climate Action Now points out CA natives to participants in the tour. With no irrigation, this amazingly resilient garden is lush with blooms after our long, dry winter. 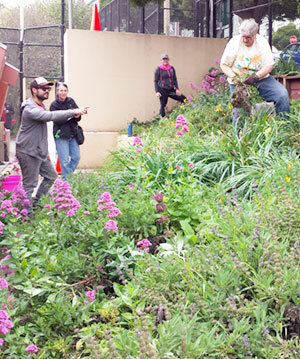 Upper Noe simply enjoys the garden for its beauty and low-maintenance, while Markos' organization actively promotes replacing pavement with CA natives. 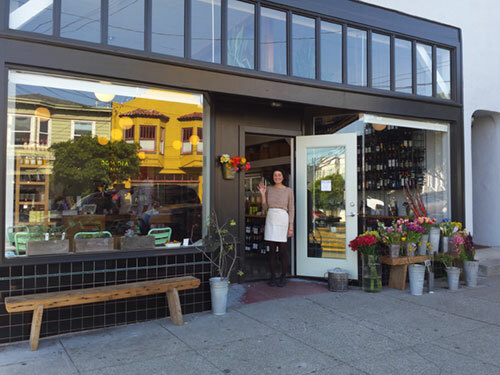 Thanks go out to Bom Dia Market, our new neighbors at the corner of 29th and Sanchez, who raised over $500 for our park and programs on Sunday, April 26, at their spring celebration. A percentage of all purchases made that day went to support Upper Noe Recreation Center. The festive atmosphere of the event livened up Sanchez Street and the food samples were delicious. Upper Noe Community Recreation Council / Friends of the Noe Valley Rec Center monthly meeting. Agenda: A focus on the San Jose Ave/Dolores St/Randall St area…the changes that have already occurred and the plans for more to come. This will include the need (and demand) for better neighborhood participation in these decisions and follow through on what the studies have shown. Upper Noe CRC and Fairmount School host a free family FUN-raising event featuring entertainment, games and refreshments. Volunteers welcome. Rec & Park is offering tours of the proposed trail and taking feedback. Beacon Street across from Billy Goat Hill. A free community BBQ / celebration hosted by Captain McFadden and SF Police Department’s Ingleside Station bringing neighbors together in a safe and friendly atmosphere where they can also get to know the law enforcement officers that serve them. • Help advise the city on what classes should be offered at the Upper Noe Rec Center. • Lead a new event. • Garden at the Park.